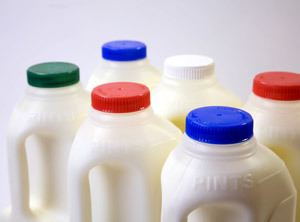 Think Green Thursday: Know Your Plastic Facts! You are always told to recycle your plastic but do you know why it truly benefits our earth to do so? Check out some of these facts about plastic and the importance of recycling plastic below inside of this installment of “Think Green Thursday”! 1. Did you know that Americans use 2.5 million plastic bottles every hour with most of them being thrown away!? 2. 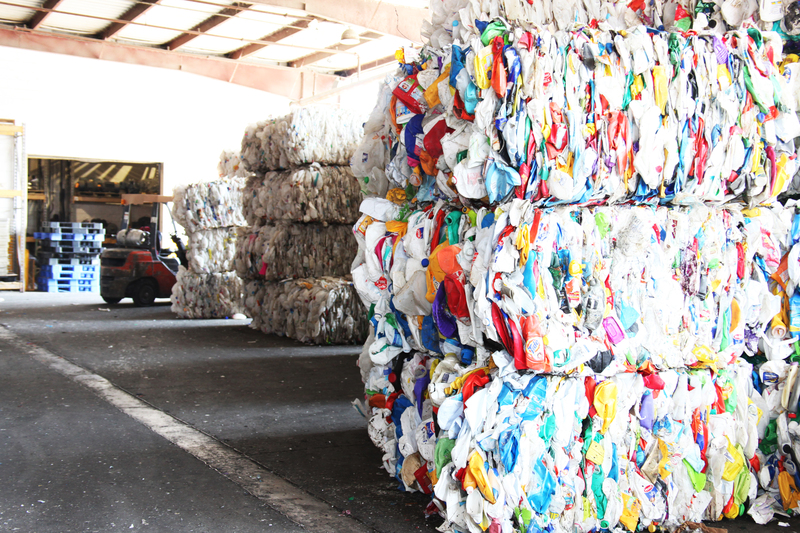 Recycling plastic saves twice as much energy as burning that same plastic in an incinerator. 3. If you choose to throw your plastic bag into the ocean consider this: plastic bags that are thrown into the ocean kill as many as 1,000,000 sea creatures a year. There is a such thing as the “Great Pacific Garbage Patch” that is twice the size of Texas and floats in our world’s water somewhere between San Francisco and Hawaii. 4. If you choose to recycle your plastic, then you are saving three to give times the energy generated by waste-to-energy plants. 5. According to experts, recycling one ton of plastic saves the equivalent of 1,000–2,000 gallons of gasoline! 6. As plastic water bottles are shielded from sunlight in landfills, they will stay there and not decompose for thousands of years! So think about these facts the next time you are faced with the decision to recycle your plastic or not! Do you recycle your plastic? The following is a letter to the editor of the Lahaina News (Lahaina, Maui, Hawaii) printed on October 27, 2011. While we can’t confirm specific statistics cited in the letter, it is gratifying to read that a student at the Maui Preparatory Academy not only understands the importance of recycling, but is exhorting her fellow neighbors to recycle more. We couldn’t have said it better ourselves. Thanks Cassidy! one of our main issues in the world, recycling can help this problem. How does it help pollution? When recyclables are replaced as new materials during manufacturing, we forget the environmental destruction caused by mining for metal, drilling for petroleum and growing trees. Usually, there is always a degree of pollution made in any manufacturing system, including recycling, but production using recyclables is surprisingly less. When recycling paper, you help reduce air pollution by 74 percent and water pollution by 35 percent. When recycling cans, you help reduce air pollution by 95 percent and water pollution by 97 percent. How awesome is that?! my mom has said about it. feeling that you don’t want to lose. materials are extracted from the Earth. of diesel fuel and greenhouse gas equal to taking 25 million cars off the road! wonderful people. Please just spread the word. Rudi Becker, method’s Resinator (Director of Package Development) explains the process of creating Ocean PCR, from his blog post on method’s website from June 15 of the this year. While the picture below is an extreme example, many of us have been confronted with ever increasing amounts of plastic that wash up on our coastline. 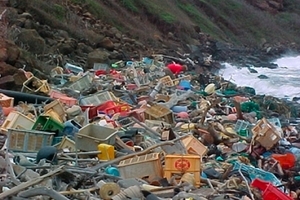 It’s estimated that several billion tons of debris continue to be added to our oceans each year. Many folks are actively working to try to clean up the trash that ends on beaches, but we had to ask the question: What is happening to all that plastic that is recovered from the ocean? Couldn’t we divert this plastic and reuse it? Late last year method got involved with the California Coastal Commission and helped support California Coastal Cleanup Day at a beach here in South San Francisco. We thought that if we could sort out the right types of plastic from all the trash, we could take ocean plastic and remake it into new bottles. The method clean up team hits the beach! After hours of trolling the shores of San Francisco Bay we were able to pull together several hundred pounds of rigid plastic that we deemed suitable for the experiment. We had to be careful to try to only select plastics that we knew had relatively the same melt temperature which would help with processing of the material later on. The little bits of plastic are then put into a giant washing machine that removes any junk that may have come along for the ride. At this point in the process Envision will optically sort the material and will grade it by color (we did not take this step with the ocean plastic, since this was experimental). We are not done yet. We still don’t have the plastic in the right form to make bottles. The last step is to make what are called “pellets”. These are just little round disks of plastic. 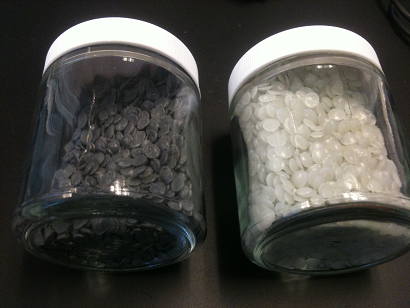 On the left you can see plastic pellets made with our ocean plastic and on the right you can see plastic pellets that are made from typical bottles you throw into your recycling bin. The color difference has to do with the fact we skipped the step of optically sorting the plastic so we ended up with a mix of colored plastic resulting in the black pellets you see below. and actually make a bottle with it. After a number of tries we were able to setup up the extrusion blow molding equipment to make pretty decent looking bottles. 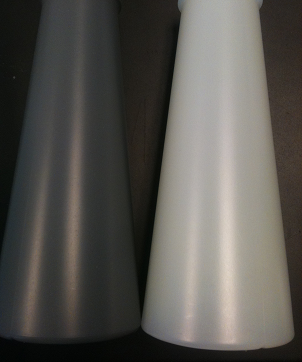 Again the bottle on the left was made with the ocean plastic and the bottle on the right was made with standard PCR. This is an exciting first step and without a doubt proved to us that ocean plastic can reincarnate itself as another bottle. ourselves a simple question: what is the ultimate post-consumer material? That led us to ocean plastic. What if we could gather some of the plastic floating in the North Pacific Gyre, and make bottles out it? We would be taking trash and upcycling it into something useful that could be recycled again and again. And more importantly, it could serve as a platform for communicating the real solution to humanity’s legacy of plastic pollution: using the plastic that is already on the planet. Well, we’ve done it. 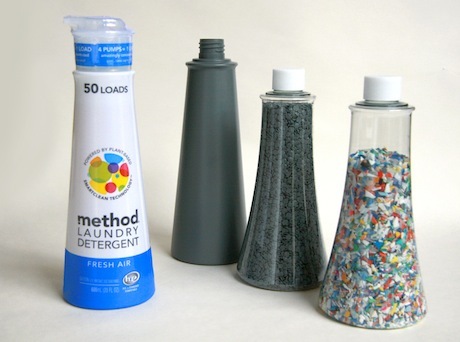 Recently, method was able to make bottles out of Ocean PCR. 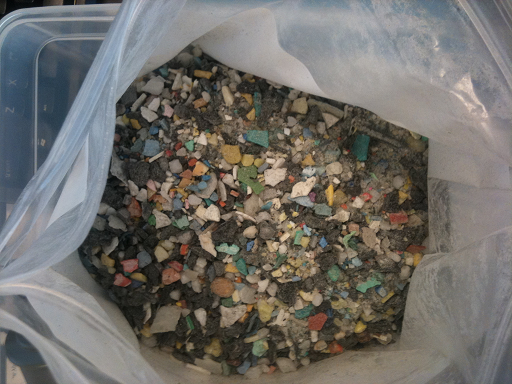 It is 100% post-consumer HDPE, 25% of which is plastic we have collected from the Gyre. 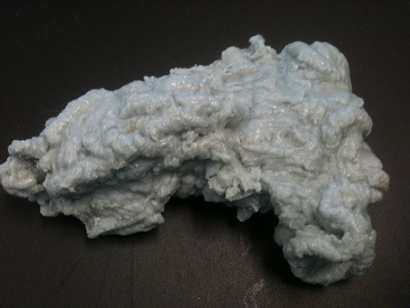 material that’s floating in the ocean 2000 miles off the West Coast? To solve these problems, method looked to the experts to partner with. big to address. Since then Envision has donated line time, invented new processes, and busted through barriers to help us engineer Ocean PCR that has similar product performance to virgin HDPE resin. In fact, an entirely new process has been created that allows us to clean, blend, and remanufacture low quality material into high quality plastic. 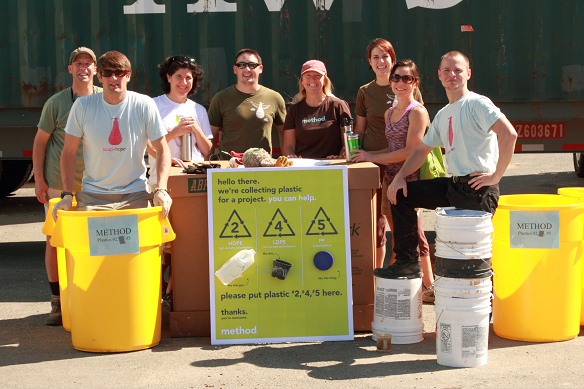 On the supply chain side, method tapped into a network of beach cleanup organizations, particularly in Hawaii. Hawaii, as one of the most remote land masses on the planet, sits at the southern edge of the Gyre. 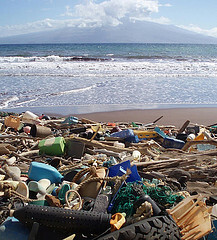 Because of the ocean winds and currents in the region, much of the plastic from the Gyre ends up washing up on the beaches of Hawaii. The strategy would be to intercept the plastic that they collect, normally bound for landfill, and divert it to Envision. Having participated in some of these cleanups ourselves, we have picked up bleach bottles from Japan and household items from mainland USA, on beaches in Hawaii. 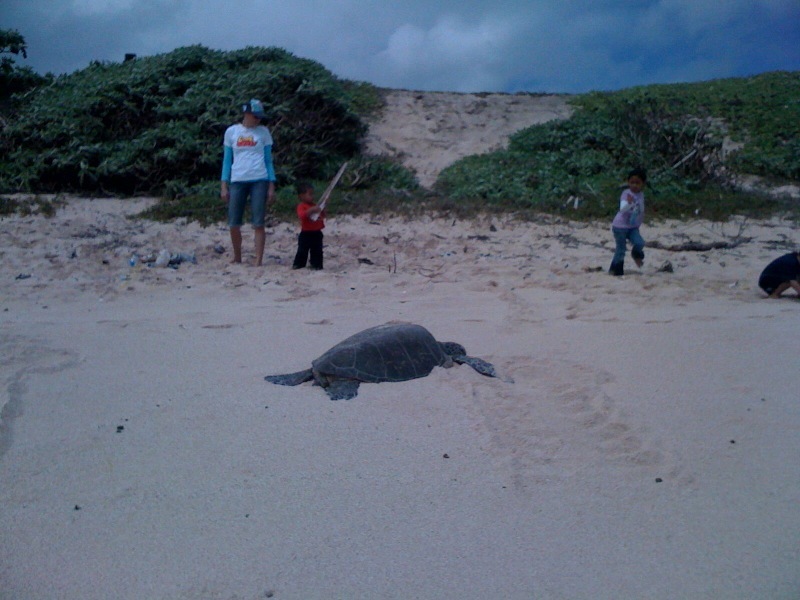 During one cleanup, a Hawaiian monk seal and a green sea turtle crawled up on the beach while we were picking up plastic. Two endangered species, making their home on a remote beach made of plastic. small. The goal is to raise awareness about the issue of plastic pollution, and to point us toward the solution already in front of us – using the plastic that we already have. That way, more people will ask for it, and more manufacturers will make it. And perhaps we’ll be one step closer to a more verdant and sustainable world. …and check back next week for Rudi Becker’s report for more details on how we did it. Rudi is method’s resinator, otherwise known as our packaging director.